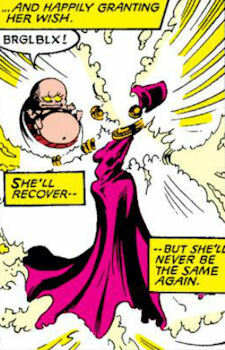 Powers/Abilities: The Witch-Woman possessed a variety of magical powers, only a few of which have been shown. She could apparently generate detailed illusions in anyone exposed to a special gas, allowing her to show them visions and enabling her to in turn read their minds (or reactions to the visions) to see what kind of person they were. She could break down a person's mind slowly using heated barbs, apparently as part of a process intended to ultimately reform criminal behavior. She could also generate magical energies around her hands, presumably a precursor to some kind of mystical attack, and she could undo changes to reality done by Jamie Braddock. 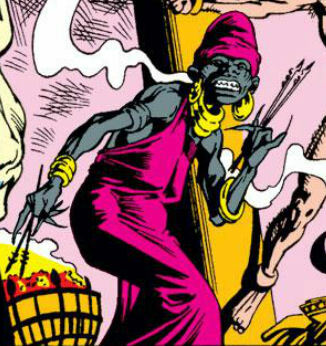 History: (Marvel Atlas#2) - Kura was an ancient tribal sorceress, the "Witch-Woman," of Mbangawi's J'Dare tribe. The J'Dare were rivals to the Gawan tribe, and such tribal rivalries had plagued Mbangawi since the Gawan tribe's N'Dingi family had come to power after the country gained independence in 1961. Seeking to end the rivalry, when young Joshua N'Dingi ascended the throne following his father's demise he ignored advice from his own tribe's elders and appointed Kura as his confidante and advisor. Loyal to him, she used her powers to help him root out governmental corruption. (Captain Britain II#9) - Kura was in charge of the torture of Jamie Braddock, heating up the pronged spikes which were presumably intended to be used on him. (Captain Britain II#10) - The Witch-Woman was present when Captain Britain invaded the Emperor's Compound seeking to rescue Jamie, and witnessed his visions alongside Dr. Crocodile. Once Captain Britain emerged from the illusions, Dr. Crocodile asked her to judge Captain Britain's guilt or innocence with regard to culpability in his brother's crimes; she stated that he was innocent. (Excalibur I#15 (fb) - BTS) - The Witch-Woman continued to torture Jamie for several months, breaking down his sanity (apparently as a precursor to try and cure his wickedness and not just as a sadistic punishment). Eventually she foresaw that the Emperor's Compound would be attacked on a specific night, a prediction the guards took seriously. She also warned her monarch that Jamie would escape to wreak havoc and advised Dr. Crocodile to slay him, but this warning was ignored. (Excalibur I#15) - That night the Technet came to rescue Jamie. When Gatecrasher, Yap and Joyboy intruded into the torture chamber, the Witch-Woman began gathering magical energies around her hands in preparation to repel them, but before she could unleash whatever attack this was, Joyboy read her desire to be one with the cosmos and used his powers to grant that wish, though the parahuman knew she would eventually recover from this experience. (Marvel Atlas#2) - Having recovered from her own ordeal, Kura eventually rescued Dr. Crocodile, whom Jamie had transformed, from the Technet and reality-warper Jamie Braddock, and restored Joshua to his normal form. Comments: Created by Jamie Delano and Alan Davis. A Marvel UK character. 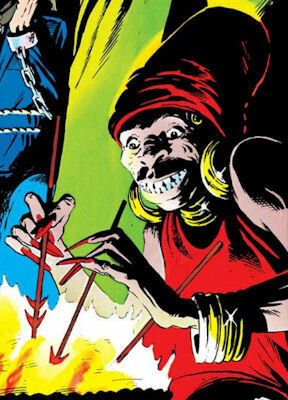 The Witch-Woman's name was revealed in Marvel Atlas#2, as was her tribal background. 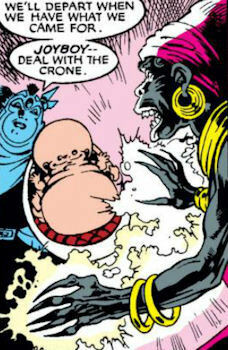 When Captain Britain is put through his paces in the illusionary world and comes out of his trance, Doctor Crocodile looks to the Witch-Woman for analysis of his guilt or otherwise, suggesting that it was she who conjured and controlled the images seen. However when Gatecrasher and Yap are later put through a similar process, the Witch-Woman is indisposed, and it is clearly Doctor Crocodile who directs the experience. Perhaps the gas induces the visions, but the actual displays are magically controlled? The first time round, the Witch-Woman supervises things, but by the time the Technet come calling Joshua has been taught enough to do the job himself?